Analytics can help banks take a closer look at themselves, not just their customers, according to a top analytics manager at one of Canada’s big six banks. 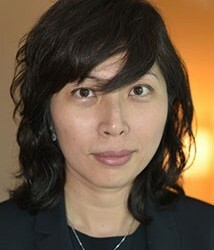 Financial institutions around the world are using analytics to target customers more effectively through outward marketing, said Rebecca Pang, senior director of channel strategy and analytics at CIBC. But banks should also consider how data can lead to internal improvements in areas like staff training or branch services, she said. “You’re going to influence your customers (with analytics) but you have to influence your staff first,” Pang said in a presentation at the Big Data and Analytics Summit in Toronto on Thursday. For example, Pang cited research showing almost one-third (32 per cent) of bank customers never set foot inside a branch during all of 2014. A cursory response to that data might focus even more effort on catering to the growing base of online and mobile customers. Yet that would bypass the chance to grow the digital customer base even further and also risk alienating the shrinking segment of longtime branch-only clients. 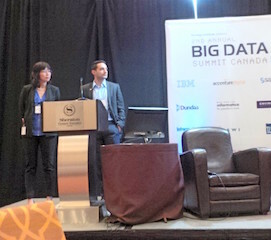 Rebecca Pang and Pouria Tehrani of CIBC presenting at the Big Data & Analytics Summit in Toronto. A deeper dive into the data, however, revealed that a certain percentage of clients still won’t try online banking simply because they don’t know how to use it. Instead of ignoring those customers’ needs, some banks have specifically trained “SWAT teams” to show such branch visitors exactly how to use online services, Pang said. “It’s not just training. Those staff have to be passionate about helping the customer in how to use the online banking service,” she said. Her point illustrated how data collected and analyzed in digital channels can lead to internal changes that improve service for customers even in non-digital channels. According to Pang, clients who use both physical branches and digital banking services are known as omni-channel customers, and there’s a good reason to pay attention to them. Despite a high level of interest in big data among banks worldwide, a Dec. 2014 study by EY found that a shortage of analytics talent is a key challenge; only seven per cent of those surveyed said they had “sufficient numbers” of data analysts throughout their business. Two other top obstacles to maximizing their data were regulatory issues (cited by 43 per cent) and privacy concerns (named by 36 per cent). Still, any business can take a data-based approach to serving customers, attracting new ones and aligning operations with analytics insights. Here are some tips on that from Pang and her co-presenter Pouria Tehrani, director of channel strategy and analytics at CIBC. Pang: Banks must integrate omnichannel analytics internally for staff, not just customers. Banks collect data on each client through various channels such as mobile, online, ATM, branch and phone. When those pieces of data remain siloed and aren’t integrated, it’s tough for banks (or other companies) to provide each of their customers with consistent service from one channel to the next, said Pang. That’s why CIBC centralizes data across channels “to form a unified view” of each client, she said. When CIBC launched a marketing campaign to win new clients, it didn’t just use analytics to track results in every channel. To aim for high quality data that wasn’t skewed, the bank used various data sources, developed a standardized testing and evaluation process and set up control groups to reduce “noise” in the key performance indicators, said Tehrani. Even when things at your business are going well, you can use your data to figure out why, Tehrani advised. After CIBC’s marketing campaign brought in double the targeted number of new customers, the bank realized extended weekend hours played a central role in the promotion’s success. “You need to look deeper. Figure out what combination of incentives and products is working well,” Tehrani said.